Coindoor: 2 x 2-Player coin doors from Twisted Quarter or similar. I have 3 4'x8' sheets of 3/4" MDF at my disposal. They need to be flattened out a bit, as they've been sitting in a humidity controlled environment. A friend of mine has a home-made CNC that cuts up to 4'x6'. With some time and luck, I'd like to recreate everything in AutoCAD or similar (currently mocked-up in Illustrator). I like the light-weight aspect of the plywood. I play on doing vinyl graphics from GoG for the side panels, and the control panel. Everything else will be painted. I'm going back-and-forth about rotating the LCD. I've seen some excellent implementations, but I'm not sure I want to spend the time/money on it. Are other emulators (demul, TTX, etc.) able to be scripted properly? I've been setting up everything with Hyperspin, but have seen a few decent MALA themes and would consider switching. If I do decide to rotate the monitor, I'll return it to landscape orientation before going back to the front-end. Vertical themes are not currently an impedance. 1) Will a 20"x25" Shmup be overwhelming at ~24" distance? 2) I got a flush trackball and would like to do vinyl overtop without doing a plexiglass panel. My joysticks have standard length shafts and I'd like to avoid buying extended ones. I'll be top-mounting and routing the CP 1/16" or so to smooth everything out. How do I apply graphics over the trackball mount and the joystick plates? Thanks in advance for the support and encouragement. This has been 16 years in the making (ever since my last run to Putt-Putt fun and games). How do I apply graphics over the trackball mount and the joystick plates? One question, why 1 TB HDD and 100GB SSD? Would I be right in thinking 100SSD for OS, Front End, Emulators, ect. and the HDD for storage? I'm surprised no one has replied to your proposal, it sounds like a mammoth project and not only in size. I don't have a great deal of experience so I can't give you much advice but encouragement I can give, so go for it buddy! Don't wait another 16 years! I will follow your build with great interest. WIFE- But we don't have a bar. I've been following the retrograde build and I like what he's done. I have the resources to bottom mount the joysticks, but it would mean getting extended shafts for 5-6 sticks and that means more play in the throw. I chose the LS-32 because I love shmups and am willing to deal with how it performs with other genres. I got the Zippys for simple 4-way gameplay. MaLa is looking more and more tempting as a FE, as I'm interested in combining all arcade games into one list. There are plans being made to install an HDMI matrix and 50 ft. USB extension for classic controllers and run a second frontend for console games that would be played in the living room, on the sofa, where they belong to be played. So, possibly MaLa for arcades and HyperSpin for consoles. Whatever I do, I'd like to utilize EmuMovies to the fullest extent possible. For the trackball, once you route out a pocket so the TB mount is installed flush (bondo/sand around edges as needed), you can apply/trim the vinyl before installing the TB. The four outer screws hold the mount to the CP and the four inner screws hold the TB to the mount. 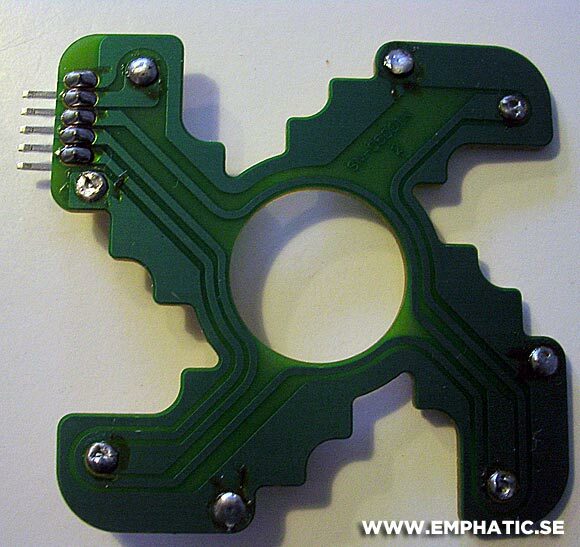 For the joystick, instead of top-mounting, consider using EMDB's shallow undermount method here. This method gives you a smooth top for the vinyl, allows you to use the shorter shafts, and allows you to remove/replace the sticks without tearing up your art. Also consider getting the quieter switches for the Zippyy's and LS-32's. Paradise sells them here and GGG offers them as an upgrade on the Zippyy. EMBD I will use the same method on my build. I think you may of set a trend here. 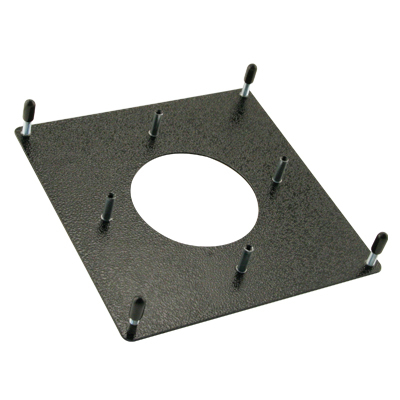 Maybe the joystick companies should include a plate and inserts with their joysticks. I may just have to use this method. Thanks for the advice on the trackball mount. Will I need to bondo the face of the mount itself? It has a bumpy texture and I'm thinking the vinyl isn't so stiff that it will hide it. My LS-32 sticks have the built in connector. I'm sure I could desolder the switches from the PCB, but I'll have to think about it. I've been using them for awhile and admittedly wouldn't mind not having as much clicking. This thread is finally getting rolling. Will I need to bondo the face of the mount itself? It has a bumpy texture and I'm thinking the vinyl isn't so stiff that it will hide it. Vinyl will almost certainly show the texture if you don't use bondo or something similar to give you a smooth surface. Oops! You have LS-32-01 or LS-32-02 sticks with a 5-pin connector, not LS-32 sticks that use regular lever arm switches with QD tabs. Not sure if there are any sound dampening mods for those models. I may just have to use this method. The structural issue is that the silent switches I linked to above have Quick Disconnect (QD) tabs on the narrow sides instead of solder lugs on the wide side. I'm cool with the QD. After all, the Lono4 comes with QD connectors. I love that thing. I'm cool with the QD. It's not a question of if you are "cool" with it. It's a square peg/round hole issue. The two switch types are mechanically incompatible due to different mounting/connection methods. I don't know if it is practical (or even if it is possible) to properly and reliably mod the -01 stick to take the QD-style switches. Picture some guy buying a car with an automatic transmission. Not knowing it's an auto, another guy suggests upgrading to a hurst shifter. The first guy agrees that he'd like to improve the shifting on the car. He mentions that he only has two pedals, but he's cool with upgrading the shifter. It may be theoretically possible, but is it worth the effort and will it work right? Well, it will only require removing a few screws and buying a $3 part to find out. Calm down. It appears it will work. I actually have the LS-32-02. The difference being the flat plate vs the s-plate. I'll report back when I find out for sure. Didn't realize that the -01/-02 base had microswitch alignment nubs on it. Glad the mod was far easier than I thought it would be. Does it work as good as it looks? Hey, no problem! I too am glad the mod was easy. They're way quieter but haven't had a chance to test them out. I got 6 kits from paradise. [deity] knows I love rotation. However If I build a 39" lcd 4 player cab today, i would not rotate the display. I would run the vert games in the middle with bezels. I would make the cab fairly shallow and the CP fairly deep to get a good viewing distance. I'd mock up the cp and display for a few hours of play to tune that distance and angle. If I needed to rotate 39"+, i'd be looking at a showcase type setup. The cab already is fairly shallow. I could trim off 1-2" width from the cabinet and a few inches if height if I didn't rotate. I estimate my viewing distance to be roughly 24". Right now it's sized to be able to clear most interior doorways (~81" tall). The control panel width will be 48" so I'm not losing much by making the cabinet 42" wide instead of 42". I'm afraid that making it too shallow with a very deep control panel will lend to tipping forward. The added cost and complexity (not to mention scripting non-MAME emulators) is a bit much to swallow. I haven't seen any large LCD rotation setups and I thought I'd give it a shot. I value your feedback. This is my first build but I've spent countless hours thinking about and reading build logos, including yours. The mod works great. Now I have to re-train myself with fighters and sh'mups.